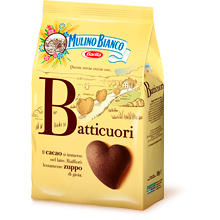 Mulino Bianco offers a wide selection of biscuits - whichever you choose you are sure to find something special! Wheat flour, powdered sugar (sugar, wheat starch), non hydrogenated vegetable fat, butter, wheat starch, cocoa 4%, chocolate 3%, (sugar, cocoa mass, cocoa, vanillin), glucose syrup, raising agents (sodium bicarbonate sodium acid pyrophosphate, ammonium hydrogen carbonate d`ammonio), emulsifier: soy lecithin, spices, salt. Manufactured in a facility that also uses tree nuts,peanuts, that also uses tree nuts, peanuts, milk, sesame, eggs.